Find 50% Off in the Mid Season Sale at EMP - Including Clothing, Footwear, Accessories and More Head over to EMP to save up to 50% on some awesome merch! Discover Game of Thrones Clothing and Accessories from £6.99 at EMP Enjoy a great range of Game of Thrones merch including clothing, posters, Funko Pop's and so much more at EMP. 10% Off Orders with Newsletter Sign-ups at EMP Simply sign-up to get 10% off your next order at EMP! Free Delivery on Orders Over £35 at EMP Save yourself on delivery costs when you spend £35 or more at EMP. Up to 50% Off Dresses at EMP - Vintage, Rockabilly, Gothic and More From Vintage to Gothic you will find an extensive range of dresses at EMP to suit everyone's style! Discover 50% Off Hooded Sweaters at EMP The humble hoody is a wardrobe staple so why not grab another whilst they are 50% off? In 1986 EMP was founded by a small group of friends in the city of Lingen, Germany. They wanted to give people the place to find all the best alternative music and merchandise in one place. Their extensive catalogue has grown and grown, and now they are Europe’s leading supplier of alternative music, clothing, TV, movie and video game merch. With over 20,000 products on the shelves, EMP have everything you need. From iconic video games like Assassin’s Creed and The Legend of Zelda, to beloved classic metal bands like Metallica and AC/DC, EMP have all bases covered. If Lord of the Rings or Harry Potter is more your thing, how about a 500-piece Horcrux puzzle, or a massive Middle Earth map to hang on your wall? Still not sold? How about a game of Pokemon Monopoly, or The Simpsons chess? Whatever you’re into, there’s amazing value and unbeatable choice for everyone at EMP. Sign up to EMP’s mailing list to receive news and sales offers, as well as an instant 10% off! What’s the EMP Backstage Club? The EMP Backstage Club is a loyalty scheme for EMP customers. It offers free delivery, exclusive discounts, freebies and more. It also offers VIP access to backstage areas at partner music festivals. Do EMP offer a print catalogue? As EMP have been operating since long before online shopping, their print catalogue is an important part of their history. It is available free, with new issues being released quarterly. 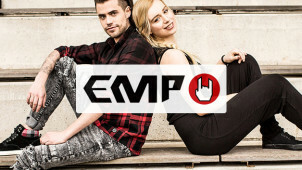 How can I find out if EMP stock my favourite band? Using their A - Z band finder or their search bar it’s easy to find all your favourite artists on EMP. Standard UK delivery costs £3.99, or comes free to all EMP Backstage Club members. EMP offer returns of resaleable items within 30 days of delivery, or within 100 days for all EMP Backstage Club members. For hygiene reasons some products, such as underwear, is non-refundable. Phones are open Monday - Friday 8am - 8pm. When you want to sport the merch of your favourite heavy metal band, look no further than EMP, with the best prices on the web’s best range of metal merch. From Maiden to Motorhead and from Slayer to Suicidal Tendencies, EMP have an astounding selection of bands, and an EMP voucher codes can help you grab a headbanging bargain. With an ace range of CDs, vinyl and merch, EMP is your one-stop-shop for heavy metal. EMP has expanded their range to include film, TV and video games, and a whole world of other fun things, from novelty mugs to smoker’s supplies. From Super Mario swim shorts to the latest Game of Thrones box-set, from Black Sabbath bandanas to Star Wars slippers, there’s something for everyone at EMP. For all the best in alternative merchandise, look no further than EMP. With thousands of bands on offer, from Nirvana to Nickelback, head over to EMP to pick up your favourite albums on vinyl. Rising record sales prove that the timeless appeal of vinyl isn’t going anywhere, and with an EMP discount code you can spin all your favourite songs on your record player without breaking the bank. With an amazing selection of metal, punk and rock, including classic LPs like The Clash’s London Calling and Ramones’ self-titled debut, set the record straight with EMP.